Missile and anti-aircraft defense crews need live fire practice too. But since they can't very well be expected to shoot at a piloted target, the UK's Royal Navy instead takes pot shots at this low-cost screamer. Unmanned systems have long been employed as live-fire targets for militaries around the world. In fact, the very first UAS systems developed during the Vietnam War, such as the Firebee, were built specifically to be shot at. The Banshee is quite versatile. 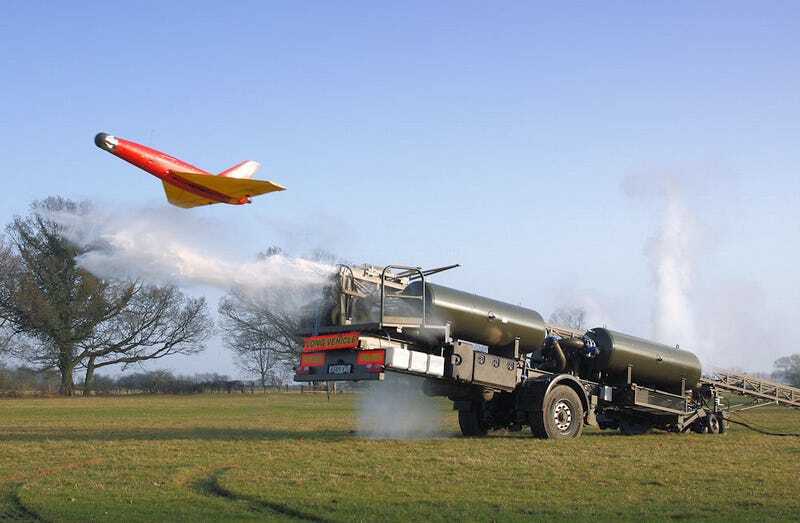 It can be launched from a pneumatic catapult either from the deck of a warship or from a terrestrial launcher. Each target is guided by a remote ground crew, though they can also be made to follow pre-programmed flight paths, and can be equipped with radar enhancement devices which mimic the radar signatures of larger threats like sea skimming missiles as well as chaff and flare dispensers to confuse incoming counter attacks. They can even be outfitted with a camera gimbal for impromptu ISR missions.